The Anker PowerWave Fast Wireless Charging Stand is an affordable way to power-up your phone, though we wouldn't recommend it for iPhone users. Inductive charging, more commonly known as wireless charging, is really taking off as more and more phone makers adopt the technology for its convenience to consumers. We recently tested the Anker PowerWave Fast Wireless Charging Stand and found it to be a well-built stand in terms of design, but somewhat lacking in charging speed for iPhone users. Android users with compatible Samsung phones will have a much better experience. 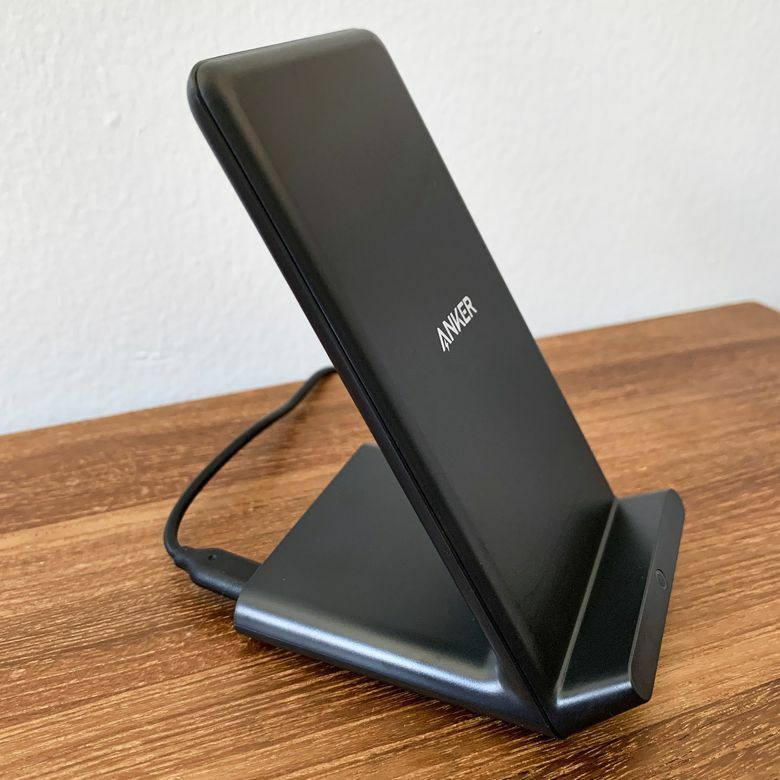 Anker did a great job with the design of the Anker PowerWave Fast Wireless Charging Stand, giving it a sleek look with rounded edges for a modern touch. The plastic casing is easy to overlook, but watch out for scratches. One gripe about this particular stand is that the cord included with the product is shorter than most of their competitors, and you have to place the stand close to a wall outlet. Fortunately, the stand is positioned at an optimal angle for you to use Face ID and view messages if you have an iPhone. There are also two charging coils working together, allowing you to position the phone in landscape or portrait mode while charging. At the base of the stand, there’s a circular LED indicator that tells users a variety of things. When you place your phone on the stand to start charging, the light will turn solid blue for three seconds and then turn off, which means it’s powering your device. The light will stay solid blue while charging and flash if it detects an incompatible cable being used. Anker says that if the light starts flashing green, it’s most likely due to an incompatible AC adapter. One annoying thing is that the light doesn’t turn off completely, which can be a little distracting if you have it next to your bedside at night. Anker includes a user manual, the stand, and a micro USB to USB-A cord in the box. It’s easy to set up, and the only thing you need to get yourself is a compatible AC adapter. To start charging your smartphone simply place it atop the stand and wait for the blue light to turn on to make sure it’s powering up. Samsung phones are boosted to 10W and can charge much faster. We tested the charging speed of the Anker Fast Wireless Charger Stand, and we were somewhat disappointed with its output compared to other chargers. Using an iPhone XS Max, we drained the battery until it completely went dark and waited about an hour so that it was completely cooled off. It took the phone about 3.5 hours to completely recharge and reach 100% battery status. The positive thing about this is that we never felt the phone or charger getting overheated. Samsung phones are boosted to 10W and can charge much faster. Those models supported are: Samsung Galaxy S9+ / S9 / S8 / S8+ / S7 Edge / S7 and the Galaxy Note 8 and 9. If you have one of these devices then you won’t have any issue using the Anker PowerWave. Devices that will charged at the standard 5W speed are: iPhone XS Max / iPhone XR / iPhone XS / iPhone X / iPhone 8 / iPhone 8 Plus, as well as the LG G7 / G7+ / V30+ / V30 / V35. The stand will work with phone cases of 5mm thickness or less. For about $20, the Anker PowerWave offers good value for budget-conscious consumers. The price point of the charger is low enough that it won't feel like a massive dent in your expenses on top of the ever-increasing smartphone prices. You can easily afford to buy multiple ones to place around the house or office. The price point of the charger is low enough where you don’t feel it’s a massive dent in your expenses. The Anker Fast Wireless Charging Stand is a fantastic way to take advantage of the inductive charging technology most smartphones have. However, the market is saturated with many options and Anker has some serious competition. One of the best-value chargers in the field right now is the Choetech Fast Wireless Charger Stand that comes in at about the same price or sometimes even a bit less. Both stands have the same features, but Choetech’s product also charges up iPhones at 7.5W speeds while Anker limits them to standard 5W speeds. If you’re an Apple user, Choetech is what you want. Take a peek at some of the other best wireless phone chargers you can buy. A solid choice from Samsung device owners, but iPhone users should look elsewhere. The Anker Fast Wireless Charging Stand offers great value for Samsung device owners as it allows users to fast charge at the maximum speed of 10W. The sleek design also complements your smartphone. Product Dimensions 3.1 x 2.7 x 4.5 in.